In this third segment of Nancy Zieman’s I Sew For Fun program, we’re highlighting Nancy’s six “Three-Button” (easy) sewing projects. Nancy’s team approach, along with one of these exciting new projects will provide a fun experience when sewing with youth. Watch the one-part series, I Sew For Fun on Sewing With Nancy. In the 72-page book, I Sew For Fun, that accompanies this program, Nancy shares her step-by-step directions for 20 super-easy sewing projects. Watch I Sew For Fun on Sewing With Nancy online at NancyZieman.com. 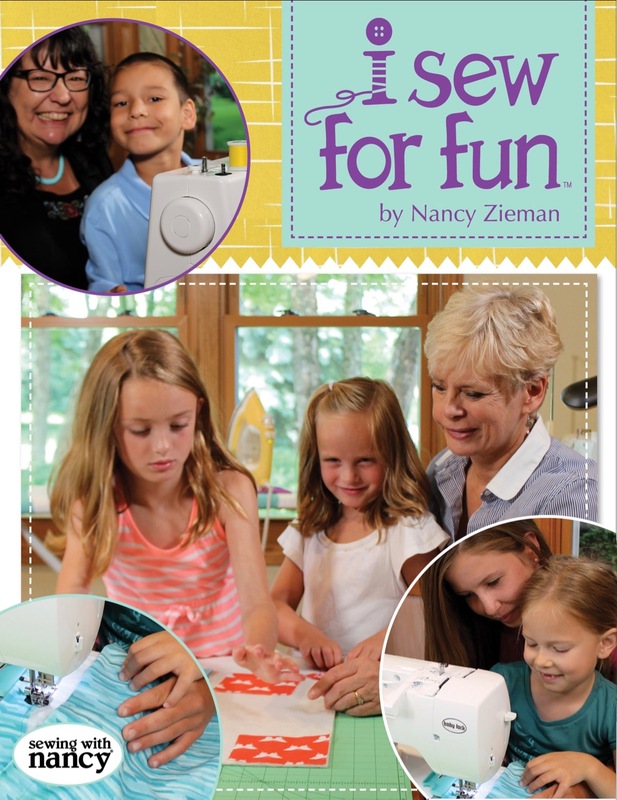 For chance to win a copy of Nancy Zieman’s book, I Sew For Fun, from Nancy’s Notions, please leave a comment below. The randomly selected winner of a copy of of Cabin Fever Quilts DVD from Nancy’s Notions, is Deborah Whaley. Her comment is: I love the bright colors and the familiarity of the log cabin block with a new twist. I am excited to try this new modern version of the log cabin. My son bought his daughter a sewing machine at a garage sale, and this book would be a great way to introduce her to sewing. My little girl actually got a kids sewing machine for Christmas, and I’ve been meaning to get stuck into some sewing with her and so this is just perfect! Would like to have this book to instruct my granddaughter who is 7. It would be fun to create a project of her choosing. I would love to have a book like this to teach my grandkids how to sew. This book looks like a good resource to use to teach my 7 year old daughter how to sew. I love sewing with my great-granddaughters, and my granddaughters before them. I have some of Nancy’s books that I use from 20 years ago. It would be nice to have an updated book. This would be great for project ideas for sewing with my grandkids – especially the drawstring backpack. I am excited to work on these projects with my granddaughters and possibly some other little gals in our 4-H club. I have been helping my 8 yr old grandaughter, Lucy, learn to sew. I hope she grows to love it as much as I do. I work with school children as I have no grandchildren. This book would be a real asset! My nephews would love the superhero cape. I think it would be the perfect item to get them interested in sewing. I’m so glad that you did a video & book for children and an adult. I would love this for my granddaughter’s birthday! She is teaching herself to sew and has her own little sewing nook in her bedroom. She draws her own patterns and makes things for her American Girl dolls and decorations! I am 72 and have watched Sewing With Nancy almost from the beginning. I now have a 7-year-old granddaughter who is just learning to sew and we would both love this book. My kids have been asking to help when they see me sewing. I would love a guide to help learn how to teach them. This looks like a great book! I have such fond memories of my grandmother teaching me how to sew. I now have three little grandsons that l love spending time with. Nancy’s example inspires me to use my sewing abilities to teach them the fun of creating. What fun to have a new generation sewing. I love the music bag! That looks like a great book for children and beginner sewers. I just love the drawstring bag! What a fun book. The superhero capes are a great way to get young boys interested in sewing. I have been introducing my 9 year old granddaughter to seeing a little at a time on her infrequent trips across the miles to grandma’s house. It is a journey of love for both of us! I would love to use this with my granddaughters. They are about the age to start learning to sew. What a beautiful legacy to leave behind. company of helpers who have supported you in the show for so many years. I now have three great grand daughters who are wanting to learn. One 7 already sewed her first lines tote bag for her mom with great success. My grandson would love the super hero cape. I’d love to make that with him. But my four granddaughters could have so much fun with me sewing so many of the projects. I love these projects for teaching kids to sew. Children love being creative with a sewing machine. It makes my heart happy to see them complete their projects. Would be great to have to teach my grandkids about sewing! I love these “grandchild and me”projects. I have taught my older grandchildren to sew, but there are 10 more, from 13 down to 4 months, sew I must get busy. With these projects there will be something for everyone. I can’t wait for my 3 year old and 7month old granddaughters to get old enough to be able to sew! Won’t be long! The “may do 99% of the work” makes me smile in agreement, but what a hoot to sit next to my 6 yr old granddaughter while she sews. I’d love to use this to teach my little granddaughter! involved in this activity too. Kid friendly items to sew. What a great book this is for kids or beginning sewists. I love sewing with my nieces. We have made Nancy’s backpacks. Would love to have the book. I have loved teaching my Granddaughter and a niece how to sew and have already started teaching the oldest Great Granddaughter with 3 more coming up the ladder. I fell it so important to teach them these fun but also useful skills. Love the inspiration that Nancy has always given and that it lives on! I would love to teach my grandkids to see from this book. My grandson asked me to make him a drawstring bag and now we could do it together. I would love to teach my granddaughter how to sew. We have a sewing ministry at church, willing to start a sewing class at church for the younger members who are interested. This would be a great for teaching my granddaughter how to sew. She wants a “sewing camp” to start soon. I finally got to teach my daughter to sew and she loves it. Now I’m looking forward to teaching my granddaughter! I don’t think I’m very good at teaching other people, but with Nancy’s help I’m looking forward to helping my favorite Littles learn the joys of sewing. I have watched these videos and can’t wait to sit down with our Grands to introduce them to sewing. Thanks so much for the instructional book and video, makes it sew fun ! My granddaughter would have lots of fun while learning from this book. She is very keen to sew and this book would keep her interested. Well done, Nancy. Great beginner projects that kids would like to do. It would be a great addition to any sewist’s library when we are helping family or friends who are youngsters become enthused about sewing. I have a 5 year old grandson that I would love to teach to sew. He’s interested but lives 150 miles away. When he comes to visit, I need easy projects for him. Sometimes he’s here only for a weekend. I think this would be a great starter book for my granddaughters to learn sewing skills. They are almost out of their teen years but none of the five know how to sew. My 5 granddaughters enjoy making their own projects. This book would give them some new ideas! The projects in this book are the kind that children just love. I would love to win this book to teach my grandson how to make a music bag as he has just begun playing the trumpet. I would also like to teach my granddaughters how to make many of these projects. Thanks! I have 5 granddaughters ages 2-6 who are eager to sit at my sewing machine and learn to sew. Each one wants to create something different, of course! This book would be perfect for teaching them. I love this book! The projects aren’t only appropriate for young sewers. Many of them have teen appeal as well. Any beginner would benefit from this book. I have already started some fun hand sewing projects with my granddaughter, this book would give us some great next step ideas! This book would be great for teaching any first time sewer. I would love to win this book to use in teaching my granddaughters some fun and simple projects.